Wow what an amazing bathroom. We're always a bit warey of putting soft furnishings like rugs in a bathroom, wont they get wet? I agree. The style actually makes this look like a fusion of bathroom and living room. It's amazing, but functionality wise, I'm just not quite sold on it. 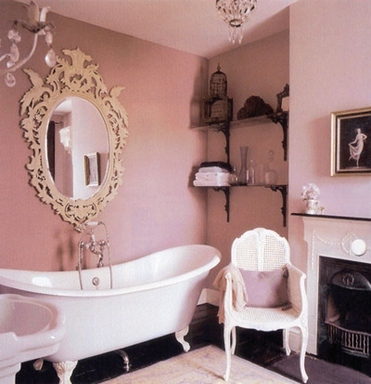 LOVE the ~pink~, my en suite biffy is all black and white tile, I have been searching for the perfect pink paint, this is it! Now is there a possibility you can share the name of the paint color and where to buy??? I would definitely appreciate it,perhaps I could post a pic to you when its finished so you can see what you think.